Regardless of whether you’re teaching elementary school, junior high, or high school, language arts is part of the common required curriculum for your students. It is a subject that builds on itself. Each successive grade should theoretically be able to take what they learned during their previous year of education and use it to help them launch themselves to new heights in the world of language arts. However, while this may be the goal and the expectation, not every student is able to reach it. Some students who sit in your classroom may struggle with this subject because words and memorization are difficult for them. Others may have a hard time finding interest in the field and aren’t motivated to learn all the material. Yet another group might find it tough to remember the details of grammar, punctuation, and sentence structure. These and other issues cause many teachers to look beyond the limits of their manuals in an attempt to find something that will connect with their students and help them truly learn the material that is being taught. This is where music comes in. Christopher Johnson, Professor of Music Education, Professor of Music Therapy, and the Associate Dean of the School of Fine Arts at the University of Kansas, conducted a study on the effects of music on learning. By comparing classrooms with outstanding music education with classrooms without adequate musical resources, Johnson was able to discover a significant difference in test scores. His research showed that test scores in English increased by 22 percent in those classrooms where music was utilized while math test scores rose by 20 percent. While theories for why this is true are varied, a number of observations hold true. Music increases the brain’s capacity for attentiveness and awareness. It also aids in memorization and information retention. Do you remember learning the song on the 50 states? You can probably still sing it today. That’s what music does for learning. It can reach even those students who struggle with every other method of retention. If you’re ready to incorporate the use of music in your own classroom, you’ll find a few tips below that will help you get started. Nothing catches the attention like something unexpected. While your students may be used to sitting down, taking out their language arts books, and staring at the board awaiting instruction, they’re probably not used to a sudden burst of music before the lesson begins. The more unexpected the music selection the better. It doesn’t have to be something classical; it can be a piece from a great movie, the theme song from a popular television show, or a catchy tune from a random band. Set the mood for learning by having your music choice be energetic, fun, and outside the box. This unexpected addition to your language arts schedule will not only provide an attention-grabbing jolt for your class but will also have them looking forward to this part of their day as they wonder what new song you’ll play next. You don’t have to be a big music buff to bring this element into your lessons; just pick the songs that you love most and your class will learn to love them too! Your interactive whiteboard is always a great way to add fun to the learning process. With the addition of special music programs, companies like Gynzy have combined the hands-on ingenuity of the interactive whiteboard with the learning power of music. 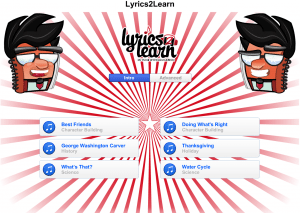 The Gynzy Lyrics2Learn tool allows you to add rhyme and rhythm to the concepts you teach in language arts and reading. This whiteboard tool is designed to help your students retain information, stay engaged, become more motivated, and learn how to apply what is being taught all through the medium of music. 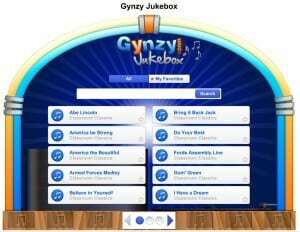 The Gynzy Jukebox provides another learning tool that can be utilized in your classroom. Whether you choose to use it as a direct learning supplement or play song selections at the beginning of your language arts section as an attention-grabber, this is another whiteboard resource that will help you take your students to a new level of learning. Movies, television shows, even popular books all have soundtracks today. Why not create your own for your language arts period? Select music that inspires thought and creativity and that will encourage learning and retention. Classical pieces are good selections for your soundtrack since their lack of vocals makes them less confusing to the mind while quiet work is taking place. If classical doesn’t strike the right chord then choose from any other collection of music that is purely instrumental. The changes in tempo, rhythm, and instrument selection will help to keep the mind alert, awake, and aware of what is happening in the classroom. A familiar soundtrack can also help your students settle into a subconscious groove when language arts time comes around. They may even look forward to their work as they listen to their favorite songs and relax into a pattern that is at once a personal undertaking as well as a group activity. Break up the monotony of typical lessons by introducing songs at set intervals along the way. Use these songs to reinforce a certain concept, boost memorization and retention, and increase interest and motivation as the lesson progresses. Including specific rhythm patterns, hand movements, or actions in your song choices will further help to solidify the information in your students’ minds. While the music you use can be written and made popular by others, including songs that you’ve written yourself is another great way to keep your class engaged. If you find they’re struggling with a certain concept, come up with a simple song or rhythmic phrase that can help them remember key points. It doesn’t have to be a masterpiece, just something that they can easily recall and repeat the next time they need it. These little songs are often the very things that end up boosting test scores and improving grades since they can be quickly remembered when they’re most needed. 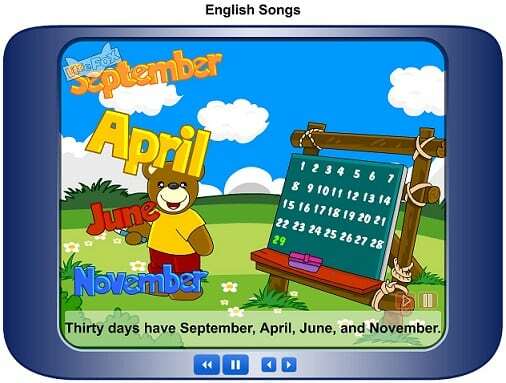 A great example to use is the ‘Days of the Month’ song from Gynzy’s English Songs tool. To build on the previous step, create an activity where your class is able to come up with songs themselves for the material you’ve taught. Break your class into groups of four or five, assign them a concept, (or have them suggest one of their own that they’ve been struggling with), then have them come up with a song that will help them remember it. Encourage them to use melodies from familiar songs such as “Old MacDonald,” “Twinkle, Twinkle Little Star,” and “Mary Had A Little Lamb.” Once they’ve finished their songs, have each group get up in front of the class and teach it to the other students so that everyone has a chance to reinforce each concept. This not only brings an element of creativity into your language arts lessons but also puts the learning into the hands of your students as they write their own songs about the concepts. The combination of these two elements provides a powerful learning tool that will help your class excel in language arts and any other subject where music is incorporated. Games are a fantastic way to provide reinforcement for concepts learned during lessons. When you use music as part of those games, you increase your students’ ability to retain and apply what they’ve been taught. Use lyrics from either the songs you’ve incorporated in your lessons or the songs written by your class and have your students play a fill-in-the-blank game. Write the lyrics on a piece of poster board or display them for the class to see using your interactive whiteboard. Leave out key concept words at various places throughout the song and have your students try to fill in the blanks. This can be done either as a group or individual activity. Once the students have correctly filled in the missing lyric, have them demonstrate their comprehension with a follow-up question. For example, if the missing lyric was a vocabulary word, have the students use it properly in a sentence. This brings another level of unexpected fun to your language arts lessons. Regardless of the way you choose to incorporate music in your classroom, doing so will have benefits that will be reflected in your students’ test scores and level of comprehension. Introducing music into your language arts lessons will also give your class the chance to experience new sounds and explore new interests. With the aid of a few unexpected songs, unique lyrics, and Gynzy interactive whiteboard tools, you can take your students’ learning to a whole new level.